Jasmine tea generally refers to a tea that has been scented with jasmine flowers or flavorings. It is usually made with green tea and is not an herbal tea. Although the most common type of jasmine tea is jasmine green tea, jasmine white tea, jasmine oolong, and jasmine black tea also exist. In some cases these variations are simply jasmine-flavored teas, while in other cases they are more elaborate blends, such as dessert teas. In addition to tea type, jasmine teas are also differentiated by the leaves used to make them and their shapes. Different jasmine green teas are made with different grades of green tea. The best are made with a large ratio of tea buds to tea leaves. These will have a subtle, more delicate flavor than teas made with larger leaves and fewer buds. Some jasmine teas are left as basic loose-leaf teas and some are cut up to be put into tea bags. Others are shaped into different forms. The most common of these is the so-called "jasmine pearl," a pea-sized, rolled set of two buds and often a leaf. Another popular shape is a spherical flowering tea with a jasmine flower in the middle. Traditional jasmine green tea is harvested, made into green tea, stored until the jasmine flower harvest, and then scented during a multi-day process. There are two ways the tea can be scented with jasmine. In the more laborious and expensive method, fresh jasmine flowers are placed on a tray below a woven tray of tea leaves in a warm room. The jasmine flowers are replaced often, at great expense, to give the tea an ethereal, light aroma and flavor. Then, the tea is dried and packaged to be sold. 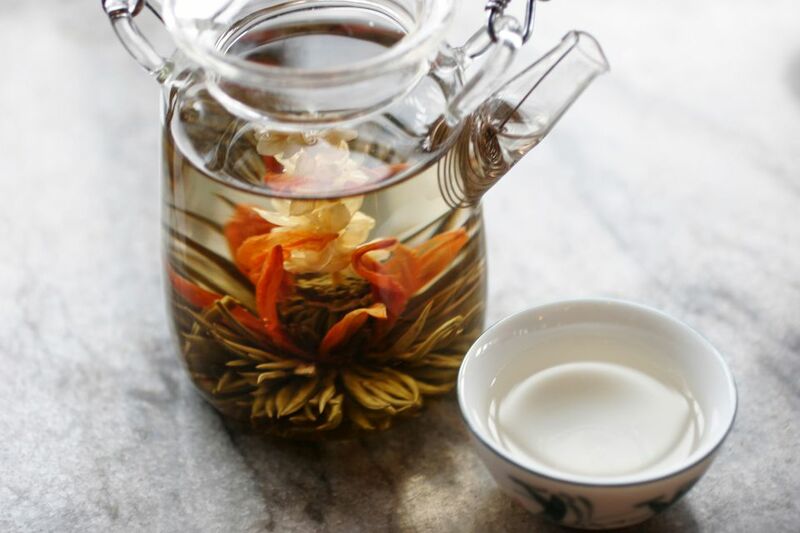 In the second, cheaper method of making jasmine green tea with real jasmine flowers, the leftover, wilted flowers from the first process are mixed in with green tea leaves, allowed to impart their scent, and then separated out from the tea before the tea is dried and packaged. Sometimes a few jasmine flowers will remain in the tea when it is sold. Some jasmine green teas are flavored with natural jasmine essential oil, jasmine natural flavor, artificial jasmine flavor, or a mix of flower flavors. Although real jasmine essential oil is extremely expensive (it's one of the most expensive essential oils in the world), this flavor-scented style of jasmine green tea is considered to be inferior to the traditional jasmine green tea. Generally speaking, jasmine tea is only as healthy as the tea used to make it was before it was flavored. However, there is some added benefit in terms of the jasmine's relaxing scent, which researchers found was akin to the lavender's relaxing scent in terms of lowering heart rate. Additionally, jasmine flavoring may entice people to drink it more often than unflavored tea, and a tea you drink is much healthier for you than a tea that sits in your cupboard. Some people also claim that jasmine acts as an aphrodisiac... and just when you thought tea was tame! Please note that there is some danger associated with drinking large quantities of jasmine tea during pregnancy and that jasmine tea is best drunk in moderation. Also, while jasmine tea (like many other tea types) is claimed to increase metabolism, it is best to avoid drinking it on an empty stomach, as it is somewhat acidic and can cause stomach discomfort. Jasmine tea is usually best steeped with filtered water that is around 190 F (simmering, not boiling)—three minutes is usually plenty. About one teaspoon per cup of loose-leaf jasmine tea is good, but you can use less tea or more water if you are brewing jasmine pearls (which only take a few pearls per cup) or jasmine flowering tea (one "flower" is enough for a large mug or whole pot of tea). When drinking jasmine tea, be sure to enjoy its soothing aroma and soft aftertaste. If the aftertaste is astringent or cloying, try a different jasmine tea, lower your steeping temperature, or shorten your steeping time. A good quality, well-steeped jasmine tea should be light and clean, with an aroma and aftertaste like a fine perfume. Jasmine tea pairs very well with many foods, so feel free to experiment with jasmine tea pairings.